The Scott D. Anderson Leadership Foundation provides high-quality, values-based leadership training and development opportunities for youth "for-the-common-good." 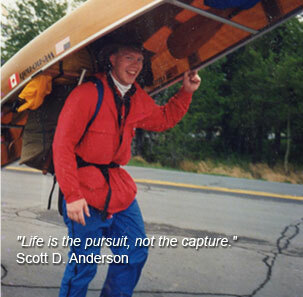 Named after Duluthian Scott Anderson, the Foundation was founded on the conviction that the leadership principles exemplified by Scott Anderson can be learned and practiced, and that the development of these traits in young people is one of the best investments any community can make. Simply put, Scott Anderson was a gifted and talented young man who had accomplished more at age 33 than most do in an entire lifetime. He died while testing the Cirrus SR20, an airplane that represented new concepts in personal aircraft safety, design and production. Despite this tragedy, his legacy lives on through the lives he touched and the hundreds of regional high schools students that are learning the leadership principles Scott lived by.